Of course the deals (and ultimately the hypocrisy) are driven by oil. A key issue for a democratically elected Libyan government, if that comes about, is how it would handle oil revenues. The “resource curse” is now a well-known theme – the problem that minerals and oil generate a large, centrally handled stream of revenue that can be very easily diverted by corrupt elites, used to buy off opponents or pay for repression, so keeping them in power decade after decade while their people rot. In theory, democracies should do better, but oil has a way of working round formal democratic institutions too. To convert oil into prosperity for all takes genuine accountability and a healthy democracy with wide participation. What has this got to do with climate change (other than spiking oil prices getting Chris Huhne excited about low carbon alternatives?). 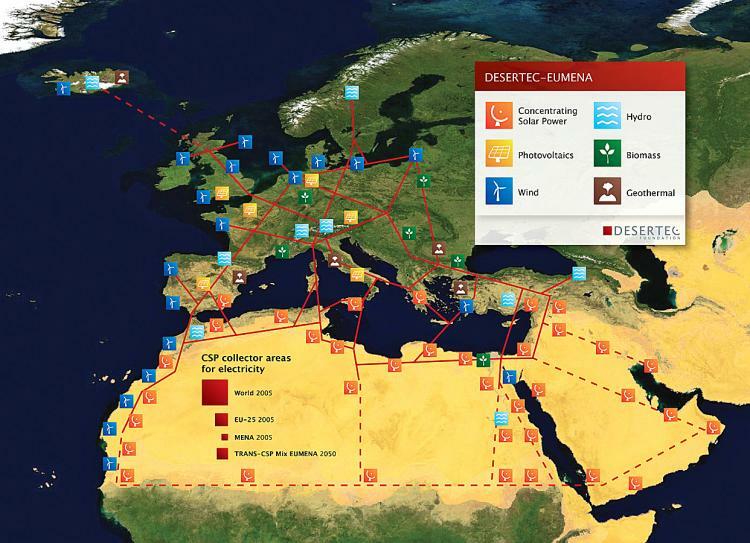 Well, one of the long run visions for a low carbon Europe – Desertec – would involve North African countries generating vast amounts of electricity using concentrated solar power (CSP) and transmitting it to Europe via long distance high voltage DC cables. There is a strong logic to this vision, since renewable resources are very unevenly distributed in Europe, CSP is a relatively predictable renewable source, and the Sahara is very big. There are questions about cost, but leaving these aside for a moment, what’s interesting about this vision is that in many ways it replicates Europe’s existing reliance on external oil and gas supply, but it also raises some very topical political questions. Europe currently gets a lot of oil from the Middle East (and Africa) and gas from Russia (and Norway). In a 2050 renewable world, it would get a lot of electricity from the Mahgreb states. So Europe’s relationship with North Africa, and the nature of politics in the region, starts to look very important. An optimistic view is that current events are a huge opportunity for Europe – a vibrant democratic politics in North Africa make a Desertec scenario a lot more attractive, make supply less prone to geo-politics, make it more likely that the proceeds of selling green power to rich Europe would benefit the many and not the few, and hold out the possible prospect of a wider region, more centred around the Mediterranean, united by energy flows and genuine democracy. Of course, that last bit might require some changes in Italy….